Growing up in the mountains of Idaho, I really had little use for shoes between the months of May to September. I had the feet of a nature child, tough enough to run over pine needles and gravel beaches without flinching. Friends who would visit from the city would enviously slip on their shoes when they realized that being barefoot on smooth sand beaches did not quite adequately prepare them for the rigors of being a forest imp. Now, one of my favorite parts of spring is finally being able to step outside barefoot, to feel the cold and muddy earth under my toes once again. In some practices, the very act of walking barefoot is called “grounding,” and it’s easy to see why. Feeling that intimately connected to the earth is grounding indeed. If you pause for a few moments and close your eyes, you might envision a root of energy or light growing from your body down through the layers of the earth, keeping you safe and supported in your spring adventures. Going barefoot for the first time each spring is one of those precious markers - the first day without a jacket, the first day wearing shorts, the first day swimming in the lake - that punctuate the way we move through the spinning wheel of time that makes up the year and the cycles between seasons. In the same way I like to do something special for the first snowfall, I also like to practice a sweet little ritual on the first barefoot day of the year, which you can find below this recipe. These cubes are the perfect way to clean up your feet when they’re caked in mud or dirt, or gently remove dead skin or other debris. Sugar scrubs can get messy and are perfect recipe for spoilage when water inadvertently gets deposited in the jar as you reach in during your shower. That’s why I decided to make these lovely single-use cubes instead. They look great in an apothecary jar on your bathroom counter, and you can just grab one or two on your way to bathe. Gently exfoliating sea salt and sugar are ground with herbs and then suspended in a glycerine soap base to make them cleansing as well as soothing and exfoliating. Foraged sagebrush is a potent anti-fungal and anti-bacterial additive, working alongside the tea tree oil to help prevent athlete’s foot or other fungal infections. 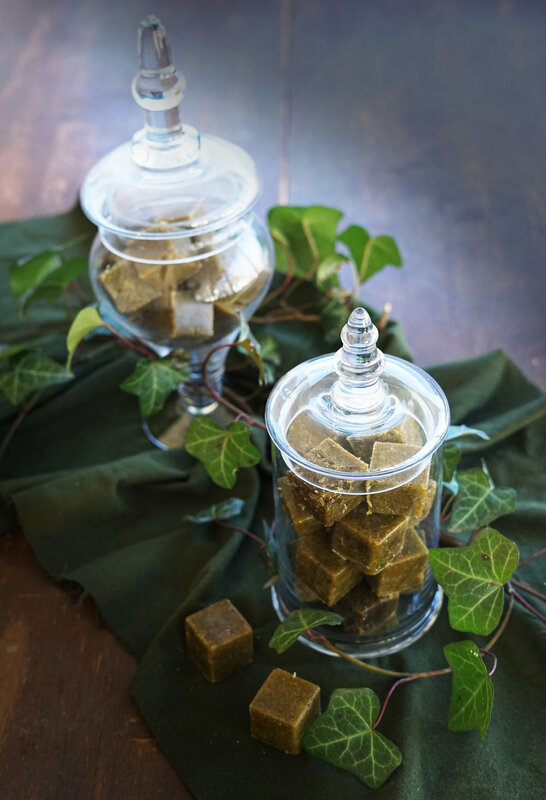 Fresh wild mint gives the cubes a fresh fragrance and will leave your feet feeling tinglingly clean. Give this easy recipe a try for a wonderful self-care treat or gift for a friend. Also, I promise your kitchen is going to smell amazing when you’re grinding up that mint and sagebrush. Grind the salt with the fresh mint and sagebrush in a mortar-and-pestle or spice grinder until you have a smooth and even paste. Spread the mixture out thinly and dry completely (may take overnight.) Blitz the clumps in a spice grinder and sift to get any lumps out. Mix in the sugar and matcha tea powder. 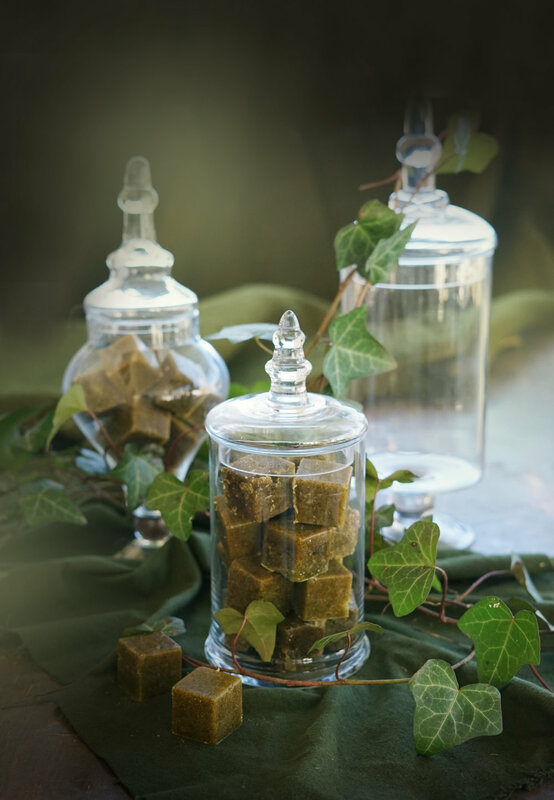 Cut up your melt-and-pour soap base into small chunks, then place them in a heat-proof measuring cup. Cover it with some plastic wrap and microwave in 30 second bursts, stirring in-between, until almost all of the soap has melted. Remove from microwave and stir to melt any remaining lumps. Add the infused oil and the essential oils to the soap base and stir to combine. Add the salt/sugar mixture to the soap base and quickly stir to combine. Moving quickly, pour the scrub mixture into the molds and set aside to harden completely. If it starts to set up before you can fill the molds, just cover the bowl with plastic wrap and microwave in 30-second bursts until you have a soft slurry. Repeat as needed. Remove from molds. If the molds were small, you’re done! If not, you may want to cut the blocks down to single-use size, or about 1” square. To use, just use one or two cubes to scrub tough areas on the feet, knees, and elbows. Rinse, and apply a lotion if desired. I remember being struck with emotion at an image of the Pope gently washing the feet of a tired-looking refugee. So much care was shown in the way his hands delicately moved. I imagined how I would feel if someone I admired took the time to engage with me in such a tender, intimate way. How I would feel elevated, would feel equal to someone in such a position of power. Most importantly, how I’d feel cared for, safe, and respected. I think the lessons of this ritual are applicable in many settings, not just those tied to particular religious beliefs or practices. We can always use the reminder to show care towards others as well as towards ourselves, and this is the perfect opportunity to both mark a sign of spring and share the joy with a good friend or family member. First, go for the first barefoot walk of the year! You may not be able to go very far yet if the earth is cold and your feet are still tender from winter. Just go as far as feels comfortable. Be sure to pause for a few moments at some point, close your eyes, and picture your feet sprouting roots that grow deep into the ground. Let the sunlight dapple your eyelids and your lungs fill with fresh spring air. Allow yourself to feel at peace with the world as your roots grow ever deeper. Once you feel ready to move on from your meditation, walk back home to your ritual space. Fill the basin with tepid water, then have your friend sit comfortably in a chair above it. Gently rinse their feet with the warm water, then use a foot scrub to clear off any mud or debris. Use the scrub on the bottoms of their feet, and clean between each toe as well. Finally, rinse each foot again and gently set them on their towel. Switch places and allow your friend to scrub your feet clean for you as well. Empty the basin and fill it with warmer water. Dissolve in some bath salt or epsom salts and add your favorite herbs or a couple sprinkles of a soothing essential oil. Let your feet soak together as you sit in peaceful silence or talk about your plans for the upcoming spring season. When you’re ready to end the soaking period, gently remove your friend’s feet from the water and dry them off with the towel. Using oil, lotion, or body cream, give your friend a little foot rub for each foot, paying attention to the areas between the toes and at the back of the heels. Gently stretch the foot backwards and stretch the toes out using your fingers. Once you’ve done both of your friends’ feet, allow them to do the same to you. Your feet are now ready for a whole new season of adventures! As you pour out the water from the basin, you may want to each state something you are shedding off after winter’s slow heaviness. Lighten your hearts for the effervescent energy of spring.